This chapter provides a tutorial for the multigrid solver module in Diffpack. With the MGtools class or the NonLinMGtools class, a standard Diffpack finite element application code can be equipped with a flexible multigrid solver by adding about 10 lines of extra code. 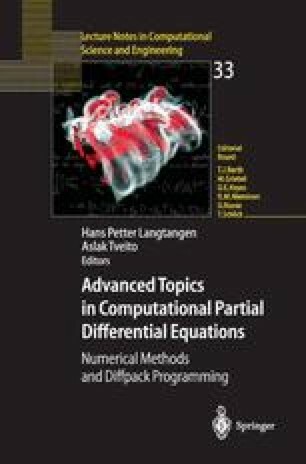 The applications covered here are the Poisson equation, more general elliptic problems with anisotropic or jumping coefficients and various boundary conditions, the equation of linear elasticity, and a nonlinear Poisson-like problem.